A business executive is releasing dangerous toxins and the Barbarian Brothers set out to stop his evil work. Ibar: Stay where you are, fatty. Gore: FATTY! Who you calling fatty, moosehead? This movie maybe really bad, but it is alot of fun. The bad acting and poor direction enhance the film's hystericalness. The twins are very funny in their Conanesque roles. If you go into this film expecting the first Conan or Excalibur, than you will hate it. If you watch it while in a good mood and accept it as good, dumb fun you will have a good time. 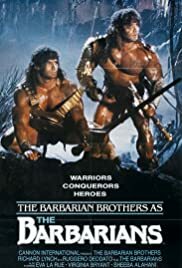 Watch for the scene where they try to hang the brothers, its funniest scene in the film. I wish Mystery Science Theatre 3000 would have done this! !